1. 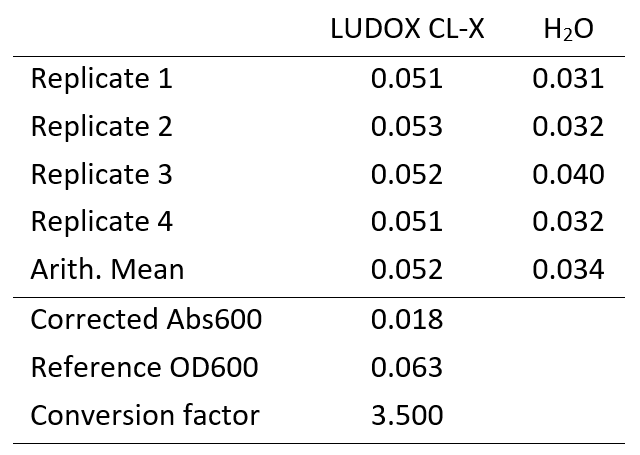 A LUDOX CL-X 45 % colloidal silica suspension was used to calculate a conversion factor for the Abs600 value measured by the plate reader to a comparable OD600 value, considering path length and well volume (Table 1). Abs600 of 1:2 dilutions of LUDOX silica suspension were taken in triplicate and a reference OD600 of 0.063 (the reference value for 100 µL of LUDOX CL-X in a well of a standard 96-well flat-bottom black with clear bottom plate) divided by the mean measured value to give a conversion factor. Table 1. Optical density readings for LUDOX CL-X 45% colloidal silica suspension and water used to calculate the conversion factor for absorbance readings to OD600 readings for plate reader measurements. 2. A standard curve was prepared by measuring the OD600 of serial dilutions of monodisperse silica microspheres, with similar light scattering properties to E. coli cells. This was used to standardise OD readings across labs (Figure 1A). 3. A fluorescence standard curve was created by measuring the fluorescence of serial dilutions of the small molecule fluorescein. This has similar excitation and emission characteristics to GFP allowing conversion of fluorescence readings to an equivalent fluorescein concentration. Calibrations allowed expression measurement in units of fluorescence per OD and molecules of equivalent fluorescein (MEFL) per cell (Figure 1B). Figure 1. Curves used to calibrate A; Fluorescein per OD using dilutions of fluorescein and B; molecules of equivalent fluorescein per particle using dilutions of solutions of monodisperse silica microspheres. Following these calibration steps, two transformed colonies for each test device and both control plasmids were used to inoculate lysogeny broth (LB) medium containing 25 µg/L of chloramphenicol (CAM) and incubated overnight at 37 °C with shaking at 220 rpm. Overnight cultures were diluted 1:10 and the OD600 adjusted to 0.02 with LB with CAM to a final volume of 12 mL. Fluorescence and Abs600 were taken at 0h and 6 hours of incubation at 37 °C with 220 rpm shaking. 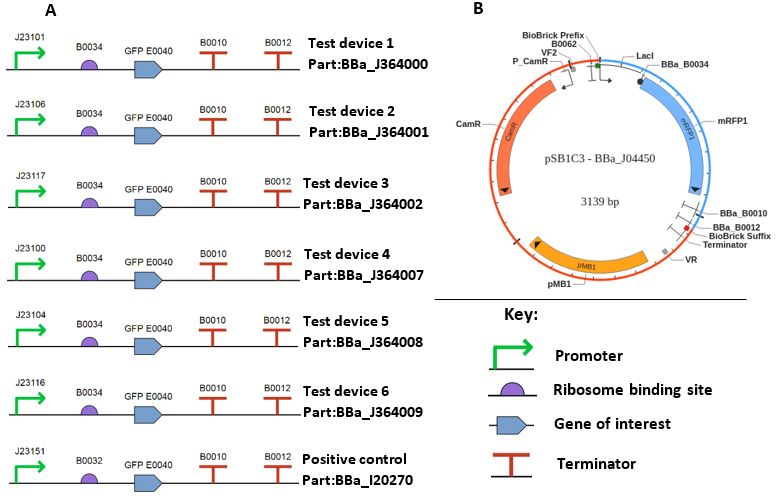 Test devices and plasmid backbone are shown in Figure 2. Figure 2. A) test devices transform into DH5α for the iGEM InterLab study. A negative control device consisting of a tetracycline resistance gene (BBa_R0040) with no associated promoter, RBS or terminator sequences was also transformed into DH5α. B) All test devices were transformed into DH5α using the pSB1C3 plasmid backbone with chloramphenicol for selection (adapted from LabGenius plasmid viewer). Results for OD600 and fluorescence measurements after 6 hours are shown in Figure 3. Figure 3. OD600 (A) and fluorescence (B) InterLab study results for positive and negative controls and all test devices after 6 hours. Tests were performed in duplicate using two colonies for each test device, results for which are shown separately to account for colony-to-colony variation. Results for both 0 and 6 hours were converted into fluorescence per OD600 and fluorescence per cell using the previously described calibrations (Figure 4). While the InterLab study is an opportunity for crowdsourcing a large amount of data on the inherent variability of a given biological system, it does not account for variations within data sets. Our team attempted to seek out and address such sources of variation, investigating biodesign automation of protocols, use of internal standards and effects of media composition. Further detail and results are available on the measurements page. Figure 4. iGEM InterLab study results for positive and negative controls and all test devices. Fluorescence was measured at 525 nm and readings were taken at 0 hours and 6 hours in a 96 well plate. A: Fluorescence per OD600, B: Fluorescence per Escherichia coli cell, calibrated to a standard curve of LUDOX silica beads.